In the last decade or so, Lyme Disease has become common in many parts of the United States. This serious,often-debilitating disease is carried by the deer tick (Ixodes scapularis) in most of the United States, and by the Western Black-Legged tick (Ixodes pacificus) in the states along the Pacific coast. Deer ticks are tiny arachnid parasites about the size of a pinhead. They aren't insects: Ticks have eight legs as adults, whereas insects, by definition, have six legs. They live outdoors, usually in tall grass and weeds. Like ticks in general, they don't actually live on their hosts' bodies. They feed on their hosts, and then fall off into the grass or weeds. Deer ticks are capable of carrying the bacterium Borrelia burgdorferithat causes Lyme disease. Borrelia burgdorferi bacteria are spirochetes (helical, or coil-shaped bacteria) that are transmitted to humans by the bites of infected ticks. They're similar to the bacteria that cause syphilis. If diagnosed early, Lyme disease usually can be treated effectively using antibiotics. But because its early symptoms are vague, many people don't seek medical attention right away; and Lyme becomes more difficult to treat as the disease progresses. This makes prevention of Lyme disease all the more important. 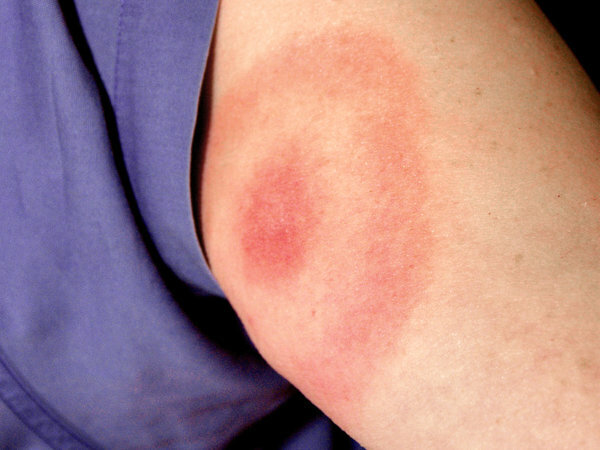 In most (but not all) cases, the earliest symptom of Lyme disease is a characteristic "bull's-eye" rash. The actual bite is at the center of the bullseye, but usually isn't obvious because it's extremely small. Any bullseye rash is sufficient reason for you to go see a doctor. Other common symptoms of Lyme disease include fever, malaise, fatigue, headache, muscle aches, and joint pain. As the disease progresses, swelling and pain in one or more joints usually occurs. In late stages, cognitive disorders, sleep disturbances, fatigue, and personality changes may occur if the disease begins to affect the nervous system. Further on down the line, symptoms may include arthritis, pain in the muscles and tendons, dizzy spells, short-term memory loss, and rashes on other parts of the body that weren't bitten. If untreated, Lyme disease can lead to permanent disability, or even death. If you have any reason to suspect that you've been exposed to Lyme disease, see a doctor right away. Blood tests are available that can confirm or rule out Lyme disease. Avoiding areas where ticks are likely to be found, especially in the spring and early summer when nymphal ticks feed most heavily. Ticks favor moist, shade environments with leaf litter, low-lying vegetation, or overgrown grasses. Wearing light-colored clothing so that ticks may more easily be seen. Trousers should be tucked into the socks, and long-sleeved shirts worn when possible. Insect repellents containing DEET (n,n-diethyl-m toluamide) have been shown to be helpful in repelling ticks. Insect repellents containing permethrin may also be applied to clothing, but not directly to the skin. As with any pesticide, be sure to read and follow all label instructions when using insect repellents, and discontinue use and seek medical assistance immediately if you develop any adverse reactions. Examine yourself carefully (or better yet, have someone else examine you)after working or engaging in recreational activities in areas that may be tick-infested. If ticks are found attached to the body, they may be removed by carefully grasping and removing the tick with fine-tipped tweezers, and then treating the bite area with an antiseptic. Don't try to smother the tick with petroleum jelly or oil, nor burn it with a match. These methods may actually increase the likelihood of bacteria from the tick's gut entering the bloodstream. If you have been bitten by a tick, consult with a physician. In some cases, it may be advisable to start treatment with antibiotics -- especially in areas where Borrelia burgdorferi is prevalent. 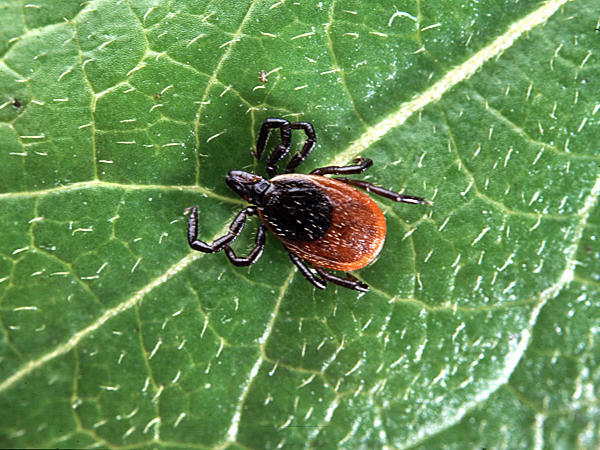 Be sure to see a doctor if you develop symptoms -- such as the characteristic "bull's-eye" rash, fever, malaise, fatigue, headache, muscle aches, or joint pain -- within a few days or weeks after having been bitten by a tick. Practice good sanitation measures to reduce rodent populations. Rodents are commonly implicated in the transmission cycle of Borrelia burgdorferi. Clean up leaf litter and keep lawns well-mowed to reduce tick habitats. When necessary, exclude deer from areas used for human recreation. Deer, as well as rodents, may commonly be implemented in the transmission cycle of Borrelia burgdorferi. If building a fence to keep them out isn't feasible, try a commercial deer repellent chemical or scare device. Established rodent and tick populations may require the use of pesticides to quickly reduce their populations. When pesticide application is necessary, it should be performed by someone with specialized experience and training in public health pest control.